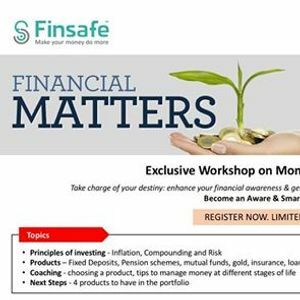 Pride Circle is excited to partner with Mrin Agarwal - Founder Director, FinSafe India ( https://www.finsafe.in/) to bring this EXCLUSIVE workshop. Financial wellness is a critical aspect of our survival, building a saving corpus, finding the right insurance and picking the right investments, and a myriad of such questions which bother us. Finsafe is a finance education organization focused on equipping people with strategies to handle their money with focus on goals, growth and safety. 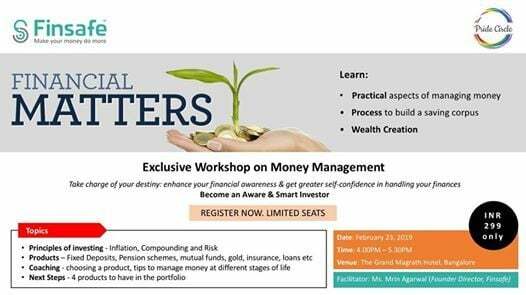 3) Practical aspects -questions to ask while choosing a product, tips to manage money at different stages of life. 4) Next Steps - 4 products to have in the portfolio.